Alma Claude Burlton Cull (1880-1931). Watercolour signed and dated 1923.. The owner is reluctant to sell but could perhaps be persuaded! An artist renowned for his ability to create beautiful, delicate skies and seas, he has here exceeded even his legendary skills. Greatly assisted by making the subject of his painting the uniquely beautiful battle cruiser HOOD - this watercolour succeeds superbly. Dated 1923 on the watercolour itself, study of the reverse of the Whatmans Watercolour Sketching Board on which Cull painted shows a pencil annotation “July 23, from Norway” thus dating this painting more precisely. HMS HOOD, the world’s largest warship, had recommissioned at Devonport, Devon on 15th May 1923 under the command of Captain J K Im Thurn CBE RN. Having been a flagship virtually since first commissioning on the River Clyde in January 1920, it was no surprise to her ship’s company that the flag officer currently flying his flag onboard, Rear Admiral Sir Walter Cowan Bt KCB DSO MVO, would in turn be relieved by a new admiral. What only a few in the battle cruiser knew, however, was that the plans for a world cruise by a heavy British squadron had finally been agreed and that HOOD accompanied by the battle cruiser REPULSE (Captain H W Parker CBE RN) would lead this deployment. The war had been over some 5 years and many people in the Dominions and British Colonies around the globe had never clapped eyes on any of the ships upon which their security had depended during the anxious years of 1914 -1918: the Special Service Squadron would attempt to redress this. 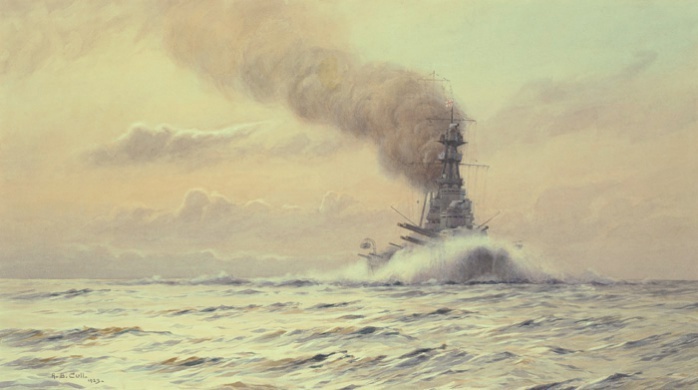 Admiral Cowan had been a firebrand: with a fine war record and a reputation for getting unpleasant things done he had been the ideal flag officer for working the battle cruisers into an operationally effective force. But talents with an emphasis on diplomacy and tact would, above all, be needed for this world cruise and their Lordships had selected Rear Admiral Sir Frederick Field KCB CMG to be the new Rear Admiral Commanding The Battle Cruiser Squadron. He hoisted his flag in HOOD in the early summer of 1923 and on 26th June HOOD and REPULSE sailed from their anchorage off Bournemouth, on England’s south coast, for Norway and Denmark on a shakedown cruise. Joined enroute by a ship fitted for “fleet photographic duties”, the sloop HMS SNAPDRAGON (Commander A Johnstone DSO RN), the great ships spent a week at Christiania (now Oslo). The fact that SNAPDRAGON was attached to the squadron is indicative, perhaps, that this was to be a high profile visit and certainly the arrival onboard HOOD on 2nd July of the senior Honorary Officer in His Majesty’s Fleet, His Majesty King Haakon VII of Norway, KG GCB GCVO, bears this out. Then it was on to Denmark. On a grey wintry day some 4 months later at 0730 on 27th November 1923, HOOD accompanied by HMS DELHI (Captain J M Pipon MVO OBE RN) wearing the flag of Rear Admiral The Hon Sir Hubert Brand KCMG KCVO CB, Rear Admiral Commanding 1st Light Cruiser Squadron; and HMS DAUNTLESS (Captain C W Round-Turner RN) eased her way out of her homeport of Devonport and swept down towards the Eddystone Lighthouse where she was joined by the remainder of the Special Service Squadron, HMS REPULSE, HMS DANAE (Captain F M Austin RN), HMS DRAGON (Captain B W M Fairbairn CBE RN) and HMS DUNEDIN (Captain the Hon A R M Ramsay DSO RN) which ship was to join the New Zealand division of the Royal Navy. HOOD now wore a vice admiral’s flag for in recognition of the crucially important role he was to play as flag officer leading this squadron “Tam” Field - as the lower deck knew him - had been promoted vice admiral on 5th November. Finally, is it significant that this watercolour recently came to light in a Melbourne auction house? One of the many ports of call made by the Special Service Squadron on that 10 month long, 40,000 mile cruise, was Melbourne, Australia. To quote (with grateful acknowledgement to Ernle Bradford’s “The Mighty HOOD”): “I remember quite clearly my father taking us out to Port Phillip Head to see the squadron come in [on 24th March 1924]. There were thousands of other people up with us. Every road and pathway was thick and many families were making a day of it…everyone who had anything that would float…was out there on the water.…. I believe the papers said there were 500,000 people waiting to see the ships. ‘Here they come’ said my father….it was a wonderful sight - something I can never forget. The mist out at sea… and then a few minutes later the HOOD herself with the white cloud seeming to peel away from her as she came on into the bright sunlight of Port Phillip. Everyone cheering and the kids running up and down and the sirens of all the ships in the harbour going off”. Subsequently in the week that HOOD was alongside in Melbourne 486,000 people visited her and the interest had been the same at Albany and Adelaide. Is there a story behind this painting of HOOD in July 1923? Was it commissioned by someone onboard (only a senior officer’s pay would stand the cost of commissioning a Cull painting) who was still aboard HOOD eight months later when she visited Melbourne in March 1924? Was it then given to someone in Melbourne when HOOD arrived there? Or did its owner subsequently emigrate to Australia taking the picture with him? What explains its appearance at auction there 84 years later?